"The smaller Spanish banks cannot finance their positions in (Spanish) government bonds through the repo market outside Spain. This shows just how little appetite their is for Spanish government risk outside Spain,"
"Only the biggest Spanish banks are managing to get funding, but backed by bonds from other countries such as Germany. 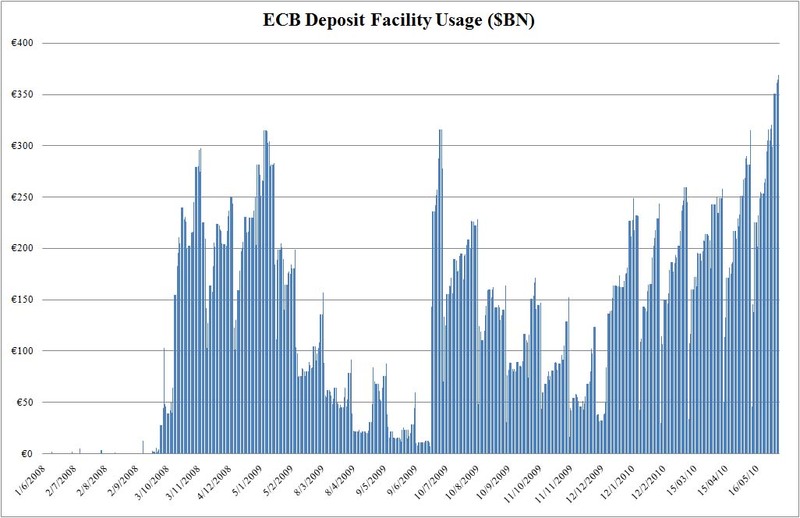 With our national bonds they are not managing to get anything,"
"The markets are almost shut for Spain,"
FRANKFURT (Dow Jones)--The amount of cash parked by banks at the European Central Bank's deposit facility increased further to a new record high, while the amount they borrowed from the ECB's marginal lending facility remained subdued, ECB data showed Wednesday. The heavy use of the 0.25% overnight deposit facility together with the lacklustre use of the 1.75% marginal lending facility signals mistrust among banks rather than a lack of liquidity. Banks, in fear of counterparty failure, prefer to place their excess liquidity in a safe haven like the ECB, rather than to lend to each other. 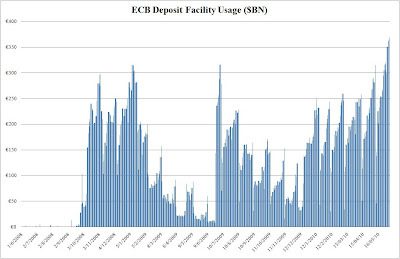 Banks parked EUR364.587 billion at the ECB's deposit facility Tuesday, ECB data showed Wednesday, compared with EUR361.69 billion the previous day. Banks, meanwhile, borrowed only EUR29 million compared with EUR9 million the previous day.